As part of the 2017 hennemusic Rock News Awards, the daily news site is counting down the Top 10 Rock News Artists of the year. Finalists for the 8th annual hennemusic Rock News Awards are chosen by readers: winners are determined by the combined total page views of the top 50 hennemusic rock news stories of the past twelve months. The 2017 hennemusic Rock News Awards winners will be announced on Thursday, December 21. Metallica’s tenth album, “Hardwired…To Self-Destruct”, debuted at No. 1 on the US Billboard 200 upon its release in November 2016, and the band carried that momentum into 2017 by performing the new material on their WorldWired tour. January saw the group on the road playing dates in South Korea, China, Hong Kong and Singapore, before making headlines with an appearance at the Grammy Awards in Los Angeles on February 12, where their single, “Hardwired”, was nominated in the Best Rock Song category (it lost out to “Blackstar” by David Bowie). 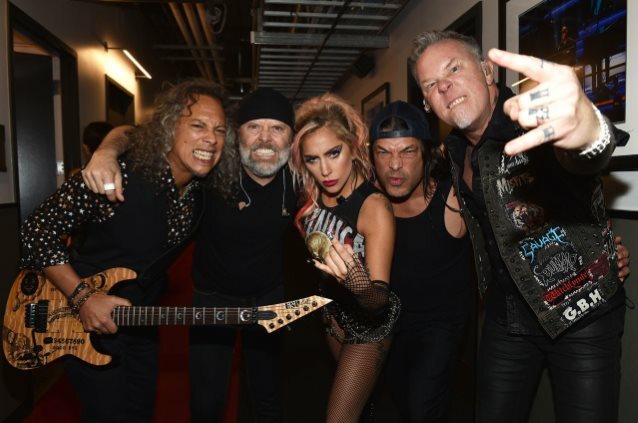 Joined at the event by Lady Gaga for a performance of “Moth Into Flame”, Metallica suffered through a technical glitch by producers when James Hetfield’s microphone failed to work during the first verse, forcing him to share Gaga’s as they played the second single from “Hardwired…”; the group eventually streamed rehearsal footage and a “fixed” vocal take on the Grammy performance. The band regrouped after the Grammys to play an exclusive, intimate show at the Hollywood Palladium in Los Angeles later that same night. Following a series of March dates in Mexico City and South America, “Hardwired…” achieved platinum status in the US for sales of 1 million copies, marking the group’s 12th album to do so since Nielsen Music began tracking sales in 1991. On May 9, hennemusic delivered a live stream of Metallica’s final rehearsal from M&T Bank Stadium in Baltimore, MD before the launch of their North American tour of stadiums at the same venue the following night. The same month saw “Hardwired…” named Top Rock Album Of The Year at the 2017 Billboard Music Awards in Las Vegas, and drummer Lars Ulrich knighted in his native Denmark, where he received the Knight's Cross of the Order of Dannebrog from Crown Prince Frederik. Metallica continued their extensive run of North American stadiums into August, and drew strange headlines when an Albuquerque, NM man faced disorderly conduct and indecent exposure charges after allegedly urinating on a family of three at their August 4 show in Glendale, AZ. On August 16, hennemusic delivered a live stream of Metallica’s final concert of their North American tour from Commonwealth Stadium in Edmonton, AB. After a break, the band returned to Europe for fall dates in September, with Hetfield making headlines when he fell into an open trap door in the stage during their September 4 appearance in Amsterdam; he was uninjured in the incident. Following the end of the European shows, Metallica returned home to headline Band Together, a benefit concert at San Francisco's AT&T Park for those affected by wildfires in California. Streamed live by hennemusic, the metal icons and longtime Bay Area residents topped the bill alongside sets by Dead & Company, Dave Matthews and Tim Reynolds, G-Eazy, Rancid and Raphael Saadiq. On November 10, Metallica continued their reissue series with the release of a series of 30th anniversary editions of their 1986 album classic, “Master Of Puppets.” The band’s major label debut became thrash metal's first platinum album on its way to US sales of more than 6 million copies. Last month, “Hardwired…” earned the group a pair of nominations for honors at the 60th annual Grammy Awards in January, where they’ll compete for “Best Rock Album” while the track “Atlas, Rise!” is a finalist in the “Best Rock Song” category. The project also dominated the year-end rock charts in the US, where they landed at No. 1 on their Top Rock Albums and Hard Rock Albums rankings. The band will return to live action with a spring 2018 run across Europe that will begin in Lisbon, Portugal on February 1.